Welcome to "INDY Reunion Association" Home Page. we have no contact with the ship it is now in South Texas to be scrapped. Please do not ask us to locate a member of the crew. You probably have better access then we do. stood up for the freedom and stood down freedom's enemies. In the Cuban Missile crisis, Indy was there. When Iraq invaded Kuwait, you were the carrier on the scene. You delivered our answer, up close and personal. have been there as America's shield and America's sword". I served in the United States Navy." while touring a city in America every year. Join the Association and Reunion info will be sent to you. Reunion open to Association members only. Brooklyn Naval Shipyard, Brooklyn, NY. Redesignated CV-62 - 28 February 1973. Bremerton Naval Shipyard, Bremerton, WA. and enjoy the memories and the stories we share. 2. Use the membership form above. Be sure your email address is on it and correct, then click send. fill it out and use the comments area for info you want to give to the web site, then click send. All information must have Name, Rate, and Date when on Indy. Also correct email address. Newsletters and discounted souvenirs, traveling to America's Cities. and getting together with fellow shipmates. All sales from ships store are returned to Indy Reunion Assoc. Our Association is always looking for memorabilia for our traveling Museum. The donated ships items will be on display at our reunions for all members to see. John Verstratae Hospitality Chairperson . 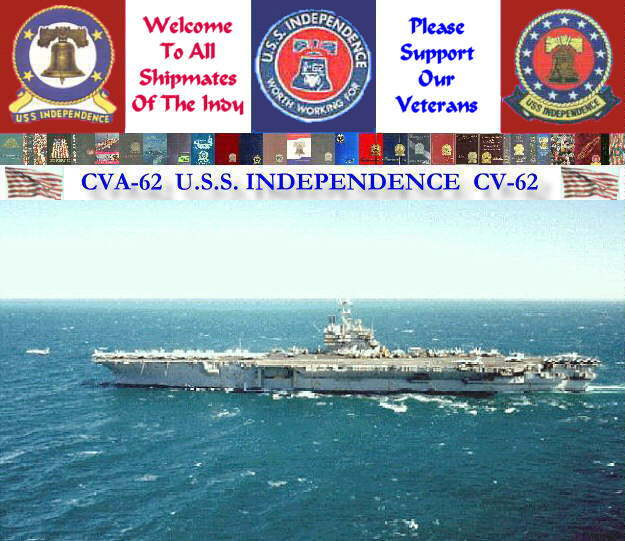 Copyright � USS INDEPENDENCE CV-62 Assoc. Inc.